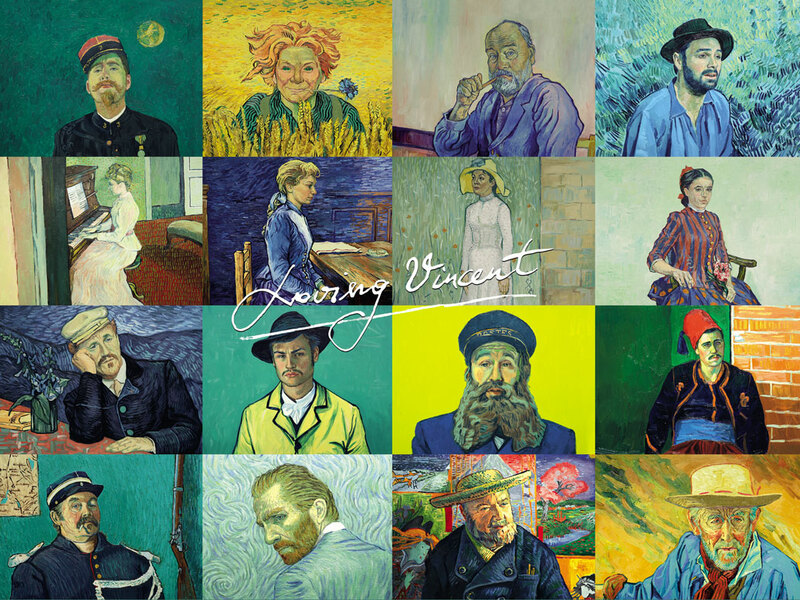 The achingly beautiful Loving Vincent, directed by Dorota Kobiela and Hugh Welchman, would be a notable film even if it were only a very fine formal experiment. The Polish-British filmmaking team, which included over one hundred painters, underwent a multi-year process to create the film, which, in all honestly, initially seemed to me like more of a gimmick than anything else. After all, there are painters whose work translates to the screen in a much more obvious and natural way, such as Turner or Hopper; Van Gogh’s highly textured thick brushstrokes, in contrast, are so tied to the surface of the picture plane that trying to turn them into three-dimensional space seemed quixotic or, more practically, quite literally headache-inducing. And it does take a little adjustment to settle into the constant motion of each frame in Loving Vincent; since the filmmakers emulate Van Gogh’s rather flat approach to depth, they have compensated by keeping the surface of every shot livened with occasionally-distracting motion even during more static moments: the flickering of lamplight in short, bright, swimming daubs of paint, or the roiling clouds in the overhead sky all absolutely conjure Van Gogh, but almost risk drowning out the figures doing the talking. However, Loving Vincent is no mere aesthetic experience; instead, it is a poignant journey into the lives that Vincent Van Gogh touched when he was alive and the ensuing effect of his suicide, taking some of Van Gogh’s most beloved paintings as a jumping-off point for the narrative. It’s almost like a who’s who in Van Gogh portraits: we begin with Armand Roulin (Douglas Booth), painted by Van Gogh in 1888, who reluctantly takes Vincent (Robert Goulaczyk)’s last letter to Theo (Cezary Lukaszewicz), his brother, at the request of his father, Joseph Roulin (Chris O’Dowd), the famous Van Gogh postman painted in 1888. After learning from Pere Tanguy (John Sessions), Van Gogh’s paint supplier, that Theo took his own life only months after Vincent was buried, Armand goes to Auvers, where the painter spent his last days, to deliver the letter to Doctor Gachet (Jerome Flynn), who treated Van Gogh for a variety of mental illnesses. Along the way we run into Marguerite Gachet (Saoirse Ronan), who loved the artist more than she let on; Adeline Ravoux (Eleanor Tomlinson), the innkeeper’s daughter with the ear attuned to gossip; and the theatrical Doctor Felix Mazery (Bill Thomas), who’s convinced Vincent was secretly murdered. Everyone in Auvers has their own opinion of the strange, moody artist who was always, always painting, whether it’s as an “evil” man, as the Gachet’s housekeeper (Helen McCrory) bluntly puts it, or as a sad, lonely fellow with a true gift. It’s established early on that Armand has little to no regard for the painter, whom everyone in Arles (save Joseph) saw as a nuisance, and so it’s quite the emotional journey to watch as the further Armand goes into fulfilling his obligation to his father, the more he becomes wrapped up in finding out why he is in the position of delivering a dead man’s letter. As he encounters real-life historical figures as well as composites based on Van Gogh paintings, such as a Boatman (Aidan Turner) and an Old Peasant (James Greene), we go from being alternately charmed by the visuals to just as horrified and urgent as Armand in a matter of moments. While the script does get a bit bogged down with Armand seriously thinking that Vincent was murdered by one of the rich young men whose acquaintance he kept, for the most part the story is slyly and cleverly done, with Armand continuously re-evaluating his own opinion of Van Gogh depending on which Auvers townsperson he’s interviewing until he’s drawn himself a fuller and more complex image of the man who painted his family not so long ago. By the time he returns to Arles, he’s a changed man, which has the effect of allowing the audience to pat itself on the back for having been more enlightened about Van Gogh than the protagonist of the film! Some of the most affecting scenes in Loving Vincent take place in flashback, where the style of the film shifts abruptly from brightly-colored and tactile a la Van Gogh to muted, soft black-and-white glimmers of memory, with a paint handling closer to that of Rembrandt. The same sequences are shown from multiple points of view, casting each actor in Vincent’s story in an increasingly ambiguous light. When Adeline Ravoux recalls how Doctor Gachet slammed the door on her as she tried to bring the dying Vincent some food and water, we immediately see him through her suspicious viewpoint; towards the end of the film, however, we see Doctor Gachet’s own sorrow and turmoil at losing his friend, who, he claims, believed everyone would be better off if he were dead. Whenever the filmmakers and artists go beyond merely re-painting the footage they’ve shot and introduce a bit of dexterity and abstraction into the details, such as the ripples on the surface of a bowl of water, the effect is sheerly thrilling. Van Gogh’s painting style is actually quite suited for many of the more intimate scenes of dialogue, as the small moving brushstrokes on the planes of a face evoke a convincing facsimile of emotions brewing beneath the surface. Ronan’s performance is particularly strong in that regard, which is a testament to the artists working on the film as well as to her acting. 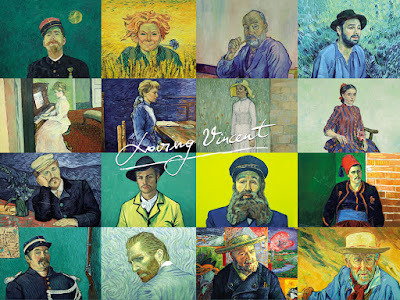 Loving Vincent is timed very well for the current trend of true (or not)-crime mystery stories (Serial, Making a Murderer, American Vandal, et al), despite its loftier art-historical pedigree. The crime is committed, or the act happens, and then everyone who knows anything about it is called upon to give their side of the story in search of the cold, hard truth of who is to blame, and why? Everyone questioned is an unreliable witness; everyone involved has something to hide that, once revealed, makes a murkier picture that much clearer. And yet at its heart, Loving Vincent knows it cannot fulfill the same satisfying tropes of the crime drama, despite its often-thrilling pace and familiar narrative format. As the film’s protagonist Armand Roulin realizes, there is no assigning easy guilt for the death of Vincent van Gogh. There is no one culprit to accuse, or any single reason why Vincent van Gogh committed suicide just as there isn’t an easy or satisfying explanation for why people take their own lives. Much like the masterpieces of Van Gogh himself, when it comes human behavior, suffering, and longing, there’s always more at play than what we see on the surface.